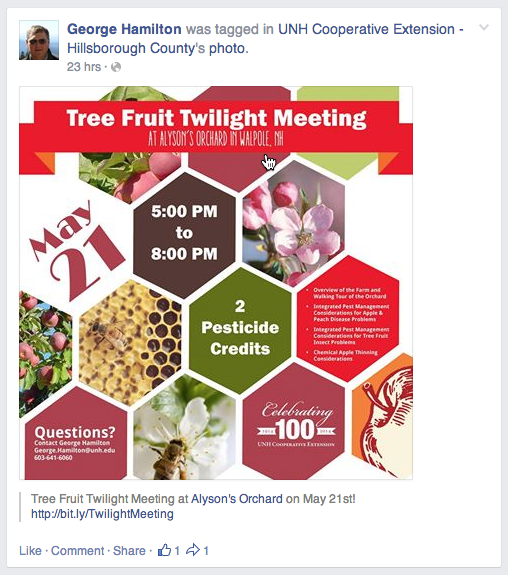 14-May, 2014 (Wednesday) Fruit Twilight Meeting at Dowse Orchard, 98 North Main St., Sherborn, MA (www.dowseorchards.com) 5:30 to 7:30 PM. 1 pesticide credit will be offered. Refreshments/snack will be served. Orchard walk, current orchard management updates. $25 meeting fee ($20 for MFGA members.) Contact: Jon Clements, 413-478-7219. Pre-registration is not necessary. 21-May, 2014 (Wednesday) Fruit Twilight Meeting at Alyson's Orchard, 57 Alyson's Lane, Walpole, NH (www.alysonsorchard.com). 5:00 to 8:00 PM. In cooperation with U. of New Hampshire Extension. 2 pesticide credits will be offered. Refreshments/snack will be served. Contact: George Hamilton, 603-641-6060. This foliar 'tonic' spray of course won't make new flower buds where none exist, but it should help strengthen a weak bloom and make better fruit set on what you have. Otherwise, pink is approaching. I am somewhat amazed when I pay attention to it how well the actual degree-days correspond with phenology and upcoming pest events. 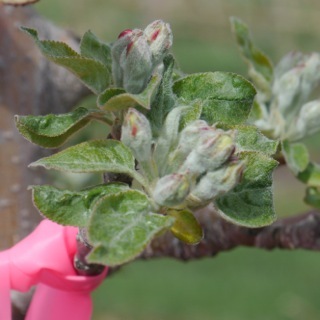 For example, at the UMass Orchard in Belchertown, we are at 252 degree-days Base 43, and apple pink bud stage is expected at 273-317 degree-days. It appears to be right on. BTW, full bloom is predicted to be Wednesday, May 14. Speaking of pink I have re-printed Art Agnello's Scaffolds article below. It is spot-on regarding insect pest management, and I am a full proponent of using pheromone traps and NEWA to help time sprays (and monitor relative pest abundance) for Oriental fruit moth, codling moth, oblique-banded leafroller. I am currently hanging pheromone traps (including Z-Traps if you are interested) for Oriental fruit moth and soon Codling moth. 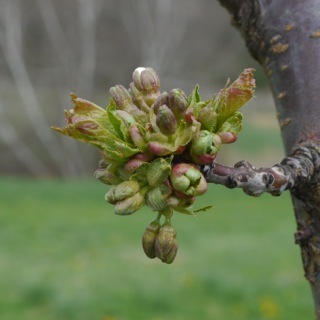 Don't forget to mark you calendar for Wednesdays May 14 and 21 for what I think will be two excellent Fruit Twilight Meetings we have lined up: one in east-central Massachusetts at Dowse Orchard on Wednesday, May 14, and the other on Wednesday, May 21 at Alyson's Orchard in Walpole, NH. Apple fruit thinning will be a hot topic of discussion depending on how the bloom turns out. 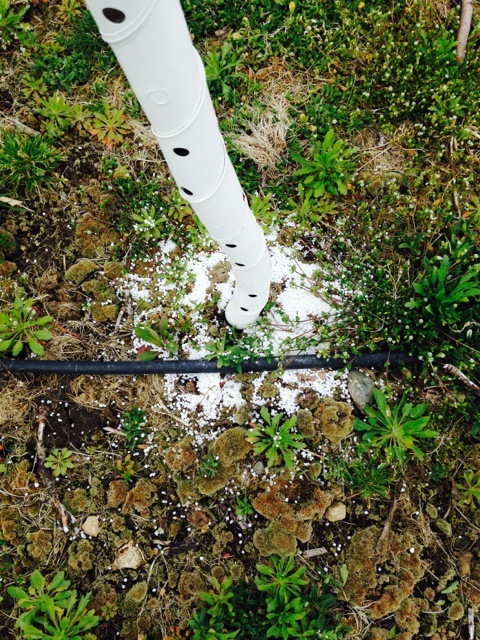 See Guest Article below for insect management at pink. Spore-trapping: The outdoor spore-trapping device in Belchertown was checked on Monday. The microscope slide was returned to the lab and examined. No ascopores were seen on the slide. The RainWise weather station reported 0.03 " rain on Sunday. Some models called this an infection period; others did not. Squash Mounts: performed on Monday on scab that was on leaves outdoor all winter in Amherst; many elongated asci stuffed full with mature ascospores were seen on the microscope slide; no free ascospores were seen. Petri Plate Assay: performed on Monday on the Amherst leaves; a few ascospores were seen on the microscope slide. Last Thursday and Friday we had the major infection event of the year, so far. With over two inches of rain, the durability of protectant fungicides was undoubtedly tested. With that thought, I’d like to share a slide from one of Dave Rosenberger’s talks below. It’s based on work done by another Cornell pathologist several years ago, looking at fungicide depletion using a controlled environment. 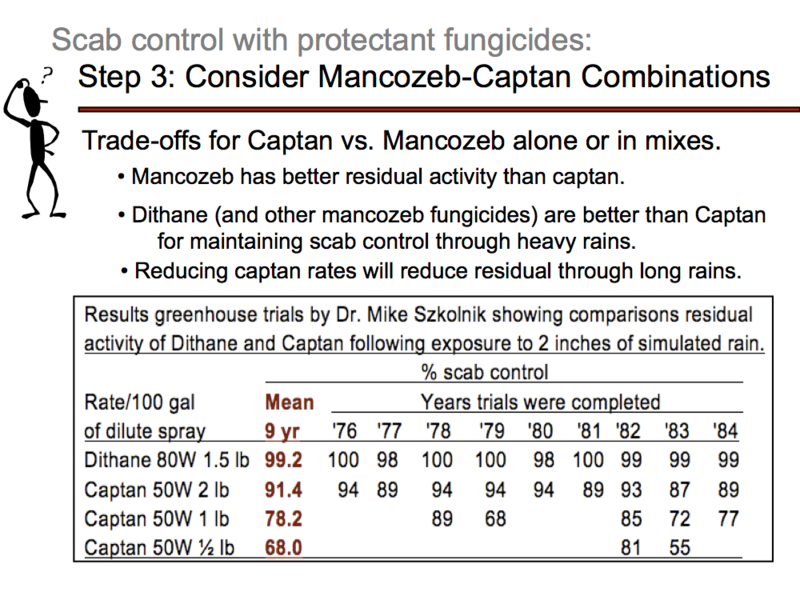 It shows pretty clearly that mancozeb lasts better in the rain than captan. It also shows that full rates of captan last better than half-rates. Another study looked at fungicide weathering in terms of rain amounts and rain intensity. Looking at mancozeb on apple leaves, fungicide losses after only .04 inches of rain reached about 80% at torrential rain, 55% in heavy and 7% in light rain. After 0.2 inches of rain, losses from torrential rain were 91%, from heavy rain 88% and light rain 50%. In this study, most of the losses from heavy or torrential rainfall happened in the first 0.1 to 0.2 inches of rainfall. After that, losses were much less, and foliage retained about 10% of the initial application. For light rain, the depletion rate was constant, so the more it rained the more fungicide was lost. So, heavy rains remove most mancozeb early. Unfortunately the researchers in that study did not look at how effective the mancozeb was in terms of scab management. 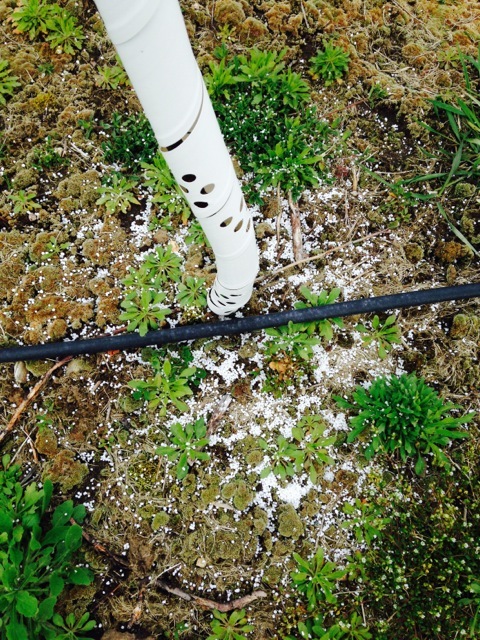 Under field conditions, heavy or torrential rains could also wash ascospores out of the air. And perhaps relatively low amounts of mancozeb still offer good scab protection. We need a better understanding of how fungicides weather. Still these studies give us a little better understanding of the process. We are in the “highest risk” period of apple scab season. All the models indicate that about half the season’s spores have matured to this point, and most of them were released in the May 1 rains. In the lighter rains over the weekend, few if any spores were released, and infection pressure was light. However, our observations presently indicate that there a large number of ascospores mature and ready to be released in the next rain, which will probably be Friday through into Saturday and Sunday. This is predicted to be a heavy infection period. The best strategy would be to apply captan or an EBDC with a systemic. Several systemics would be effective as long as resistance is not an issue. Fontelis (SDHI) should not be used with captan, but is fine with an EBDC. Other SDHI fungicides include Luna Sensation and Merivon. These fungicides are premixes that contain both an SDHI and a QoI (strobilurin). We recommend that they be mixed with a protectant as well. As we move into tight cluster and pink, we do not recommend Luna Tranquility as it is premixed with Scala, an AP fungicide that is not recommended past tight cluster. The QoI fungicides Flint and Sovran mixed with either captan or an EBDC are another alternative. We recommend no more than two back to back applications of these materials at this time for resistance management. Since Luna Tranquility and Merivon contain a QoI fungicide, applying Flint or Sovran after either Luna Tranquility or Merivon is the same as applying two applications of a QoI. The premixes definitely complicate resistance management! If you feel the DMI fungicides (SIs) are still effective in your orchard, a mix of one of them with captan or an EBDC is a good option. We recommend using the most effective DMIs against scab, including Inspire Super or Indar, though where resistance has not begun to develop other DMIs will be effective. The most important thing you really need to know right now is this for pre-bloom apple foliar tonic! But, I also got a call asking how much calcium nitrate fertilizer to apply to the ground to young (in this case, 2nd-leaf) apple trees. My general rule-of-thumb is to use 0.05 to 0.75 pound (0.1 pound at the most!) actual Nitrogen per year of tree age. Thus, these second-leaf trees should get 0.1 to 0.15 pounds actual Nitrogen. Calcium nitrate is 15% Nitrogen by weight, thus 1 pound of calcium nitrate would contain 0.15 pound actual Nitrogen, which is right in the range we want to apply to these second-leaf trees. I would split this calcium nitrate over at least two applications, one at bud-break followed by another one about a month later. (Discontinue Nitrogen application after July 1.) You will have to adjust this for any other fertilizer/Nitrogen formulation you use, and if using the higher amount, try to split over three applications. Calcium nitrate is my preferred Nitrogen source. One pound of calcium nitrate is just under 1-1/2 cups volume. Be very careful if using urea (46-0-0) as it can burn roots at higher rates and/or not properly spread. Nitrogen fertilizer should be sprinkled evenly across the suspected root zone of the trees, not in 'piles' nor too close to the trunk. (See pictures below.) Finally, if trees are starting to bear fruit, you need to add a Potassium fertilizer (0-0-60, K-mag, sul-po-mag, etc.) to the ground. (Any questions how much?) Note that this recommendation is for growing young, non-bearing trees up the 4th-5th leaf. Beyond that, use leaf analysis and your history of Nitrogen application to determine rate per acre in bearing orchards. I will say that increased nitrogen application has shown to increase yields in bearing orchards, however, soft-flesh varieties such as McIntosh, Cortland, and Macoun can suffer in fruit quality from too much nitrogen. 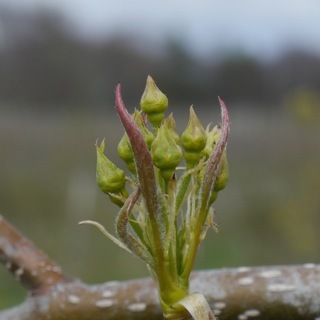 The forecast for the end of the week promises some early summer weather, so most areas should be within hailing distance of pink bud by the weekend. 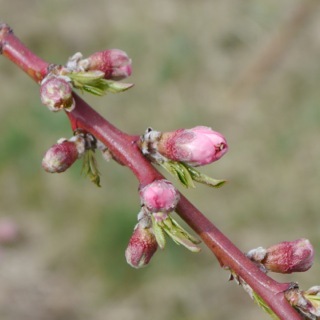 It's therefore not too early to be thinking of pink bud insect management needs now, so as not to be caught off guard in case we get into one of our famous 'let's floor it' scenarios. First, if San Jose scale is a concern and you have yet to do anything to head it off, there is still a limited window of suitable management tactics available before foliar development progresses too far to permit effective coverage. If you are intending to use oil, a 1% spray through tight cluster can be quite effective provided you're able to thoroughly cover the wood surfaces. Insecticidal options include Centaur (34.5 oz/A), Esteem (4-5 oz/A), Lorsban (4EC or Advanced at 1.5-4 pt/A; or 50WP at 3 lb/A) or Supracide 2EC at 3 pt/A). Remember that you are limited to only 1 application of Lorsban in apples per season, whether prebloom as a foliar or trunk spray, or as a postbloom trunk application. 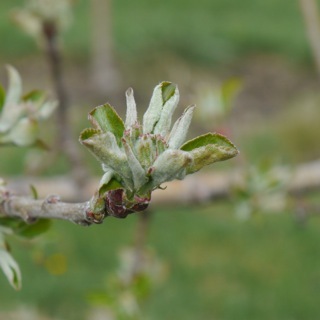 The pests of greatest concern at pink bud are usually rosy apple aphid (RAA), Oriental fruit moth (OFM), and tarnished plant bug (TPB), with European apple sawfly and plum curculio waiting in the wings. OFM just made its entrance in the Hudson Valley last week, so it will not be too long before biofix is established in a number of plantings statewide. In blocks with a history of OFM infestation, 1 or 2 traps checked at least weekly will help indicate the timing and relative size of the first generation population this year. What should be the response when the numbers start building? In a normal year, the average temperature ranges tend to result in very little egg hatch during pink and bloom, as this usually holds off until petal fall. If we end up with sufficient egg hatch before actual bloom, a pink application of an internal worm material like Altacor, Belt or Delegate would be an option; although this is earlier than we would normally expect to need them, these products would also address codling moth, which would not be far behind an early OFM hatch. For growers wishing to save these A-list products until after petal fall, a B.t. product would be another option from pink to bloom. Regardless, these "what-if" scenarios underscorethe value of using(and frequently checking) pheromone traps to set the clock on OFM and CM development in specific blocks. These first flights of the season give us the best opportunity to get on top of internal worm control, because timing and development of the different stages only gets more complicated (i.e., less synchronized) as the season progresses. Depending on block history and personal philosophy, RAA and TPB can be either annual challenges, puzzling but token annoyances, or else a complete flip of the coin. Do they occur, do they need to be treated, are they able to be controlled adequately, and does it matter if they're just ignored? These pests also have yet to indicate their potential for problems this season, although it's likely that rosies can be found already in some orchards, given enough inspection. It's possible to scout for RAA at pink, but this is often not practical, considering all the other things demanding your attention at this time. TPB is not a good candidate for scouting, and if the bloom period continues to be prolonged by cool, wet weather, a pink spray is of little use. You'll need to decide for yourself whether this bug is of sufficient concern to you to justify treating. the most effective treatment has been to use a pyrethroid, which: a) kills predator mites, and b) still rarely lowers TPB damage enough to be economically justified. If you elect a spray of Ambush, Asana, Baythroid, Danitol, Pounce, Warrior or Voliam Xpress at pink for plant bug, you'll take care of rosy apple aphid (plus mullein plant bug and STLM) at the same time. If RAA is your main concern, you could elect a pink spray (non-pyrethroid options include Actara, Assail, Beleaf, Calypso, Esteem, Lannate, Lorsban, Thionex, Vydate, Warrior, or Voliam Xpress) if you have the luxury of a suitable application window. Once again, be sure to consider potential impacts on non-target species such as beneficials, and be aware of your bee supplier's concerns about effects on pollinating bees. For more perspective on this issue, see the article from Penn State. Leafrollers are also out there, but only a portion of the population will be active at this time, so although you might get good control of any larvae you spray now, don't forget that the rest of the population won't be out (and susceptible to sprays) until bloom or petal fall, so it's probably better to wait until then to address this pest. Finally, if mites normally need attention in a given block, and you haven't elected (or been able to use) a delayed-dormant oil application as a part of your early season mite management program, you'll be needing to rely on either: one of the ovicidal acaricides (Apollo, Savey/Onager, Zeal) available for use, whether before or after bloom; a rescue-type product after bloom (add Acramite, Kanemite, Nexter, and Portal to the above list) that can reduce motile numbers later on if they should begin to approach the threshold; or Agri-Mek, which falls somewhere between these two strategies. Like the true ovicides, Agri-Mek should also be considered a preventive spray, as it needs to be applied early (before there are very many motiles) to be most effective, generally within the first 2 weeks after petal fall. Recall that Proclaim is related to Agri-Mek, and also has some miticidal activity, if you expect to use it at petal fall for leafrollers. For any of the rescue products, the operational threshold (through June) is an average of 2.5 motiles per leaf (see the chart on p. 83 of the NETFMG). The next Healthy Fruit will be published on Tuesday, May 13 or thereabouts, 2014. As always feel free to get in touch with any member of the UMass Fruit Team (http://extension.umass.edu/fruitadvisor/team-members) if you have questions or comments.